The Miracle of Medinah, and the Great, Great British. There are numerous topics I’m sure I will stumble through as this blog progresses, but one of the topics I’m most interested in documenting are some of the differences between various aspects of culture in the US as opposed to the UK. I will probably wade through heavy topics such as politics and economic stances knee deep, making up facts and quoting anonymous sources left right and center. I will also have a go at some lighter topics, such as wondering why Indian food isn’t a big deal here (nothing beats a good Jalfrezi in my mind), and wondering how and why I never learned about any British history between James Watt’s invention of the steam engine in 1770, and the coronation of Queen Victoria in 1837 (didn’t miss anything important, did I?). However, following the “miracle of Medinah” yesterday in the Ryder Cup, today’s agenda is sport, and just how great it is to be a British sports fan right about now. 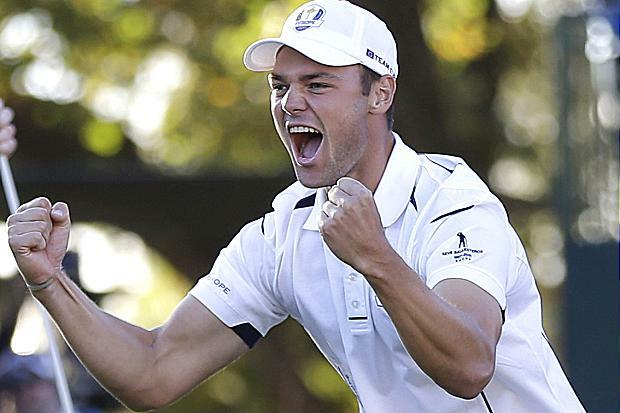 As Martin Kaymer sunk a 15 ft putt on the 18th green, ensuring Europe retained the trophy, I was simultaneously fist pumping, yelling triumphantly down my hallway and taunting my American roommates (who, by the way, didn’t care in the slightest). Yes, 2012 has been a pretty successful year for the Brits. Chelsea won the Champions League, Bradley Wiggins became the first Brit to ever win the Tour de France, Team GB over achieved in every measurable way at the Olympics, Andy Murray followed up his Olympic Gold with a sensational win here in New York, and now the predominantly British European Ryder Cup team had the comeback of all comebacks in a historic day on Sunday evening. For the most part I would consider myself a casual golf fan, but there is something about the Ryder Cup that gets my pulse racing for a three day weekend biannually, along with most of Britain. The “special relationship” Britain continually claims to have with the USA take on a new twist as the Ryder Cup arrives, with Brits relishing the chance to collectively wipe the smiles off the yanks and prove to them that Europe plays second fiddle to no one. That quote was made before this weekend’s rollercoaster drama, but captures Europe’s Sunday performance perfectly. There is another blog that will come as soon as I get round to it that will focus on the different attitudes that sports fans from across the pond have, but for now I can do nothing but heap praise on the European golfers, and every British athlete that has made 2012 a year to remember. Oh, and if you’re American, be prepared for some taunting of your own, from yours truly! Congratulations, Europe on a well deserved victory.